With its stately parliament buildings, glorious gardens and cultural amenities, the Queen's namesake city flaunts its quintessential British bent. On arrival, two prominent features—landscaping and architecture—immediately beg a closer look. Victoria cultivates the British passion for horticulture. Flowers and foliage pruned to perfection pop up everywhere: in more than 900 hanging baskets throughout the city; displayed under glass at the Crystal Garden conservatory; gracing the lawn of Government House, residence of the lieutenant governor; and even in experimental patches at the Horticulture Centre of the Pacific. University grounds and public parks are equally as lovely. Cathedrals, castles, colleges and structures crowned with domes and spires testify to Victoria's stature as a seat of provincial government. Opportunities to peek inside and find fun things to do abound. Tour the elaborately appointed parliament buildings or visit Christ Church Cathedral, one of Canada's largest cathedrals. Craigdarroch Castle, built in the late 1880s and lavishly decorated, harkens back to an affluent period. Two outstanding museums accompany the parliament buildings at the Inner Harbour. Royal BC Museum, in Thunderbird Park, covers the natural and human history of the province. In the historic, ivy-clad Fairmont Empress Hotel, Miniature World depicts diminutive scenes from history, literature and everyday life. While you're in the area, stroll along the Inner Harbour Walkway or board a traditional, London-style double-decker bus for an extended sightseeing tour. Beyond its Empirical trappings, Victoria displays a contemporary edge. You'll find first-class hotels, fine dining restaurants, luxury spas, fabulous import shops, championship golf courses, fringe theater, fine art galleries and pop entertainment. Yet the capital of British Columbia remains quintessentially British. Along with its tearooms, double-decker buses, horse-drawn tallyho carriages and shops that sell china and woolens, Victoria proudly claims another, much older culture. Totem poles can be seen throughout local parks, reflecting the destination's dual heritage. 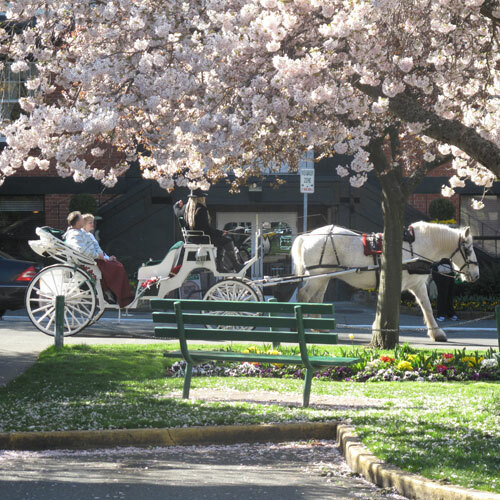 Regarded as Canada's gentlest city, Victoria has uncluttered streets, gardens that bloom year-round and hotels that have been serving high tea for decades. Sharing a passion for gardening, Victoria residents tend their prim English-style gardens. The city's innumerable flower beds and hanging baskets, nurtured by its mild climate, bloom in bright displays while the rest of Canada shivers. The heart of the city curves around the stone-walled Inner Harbour, alive with bobbing pleasure craft, fishing boats and coastal shipping vessels. Facing the harbor are the parliament buildings and the block-long, ivy-covered Empress Hotel, one of the fun places to go for afternoon tea. Emily Carr, a native of Victoria, devoted her artistic career to capturing on canvas the majestic totem poles carved by the vanishing First Nations civilizations of the Pacific coast. Like those she found in deserted tribal villages, the emblematic totems in Thunderbird Park evoke the highly developed ancient culture that dominated the area long before Victoria was settled in the mid-19th century. Fort Victoria was built by Hudson's Bay Co. in 1843. Six years later Vancouver Island became a crown colony, and as British Columbia's only port, it became a passage to the Fraser Canyon goldfields on the mainland in 1858. Thousands of European and Asian miners descended on the city, forming the nucleus of today's diverse citizenry. Violence around Bastion Square was so commonplace during this rowdy boomtown period that the Victoria Gazette reported no deaths “from natural causes in the city during the last 30 days.” Local politicians supposedly settled their debates with fist fights. After the gold fever broke, Victoria began to assume its characteristic cool reserve. Lured by modest land prices, English settlers developed their queen's namesake city into a thriving government and commercial center. In 1868 Victoria became the capital of the newly joined crown colonies of Vancouver Island and British Columbia and, in 1871 when British Columbia joined the Canadian Confederation, it became the capital of the province. Since commercial supremacy passed to Vancouver after the completion of the Canadian Pacific Railway, Victoria has adopted a slower pace with few heavy industries. The city is a center for commercial trade as well as the home of Canada's West Coast naval operations. Lumber and fishing also contribute to the bustle of this port. The city's strong tourism industry is buoyed by the stream of travelers who come by cruise ship or by ferry from Washington and throughout British Columbia. Those travelers come year round, thanks to Victoria's scenic setting and delightful climate. Flowers bloom all year, and the city only occasionally sees snow. Victoria's climate and proximity to the Pacific Ocean also provide its citizens an opportunity for an active lifestyle. Marine-based activities such as fishing, sailing, kayaking, canoeing and whale watching are popular, as are bicycling, hiking and exploring neighborhoods and parks. Whether or not Victoria is more British than Britain remains an ongoing debate among Victoria's residents. Few would contest, however, that nature's blessings have endowed the city with ample charm. No one understood this better than its native First Nations people, the Saanich Nation of Coast Salish, whose awesome totems continue to speak the land's wonder. Victoria is the western terminus of the 7,821-kilometre (4,860-mi.) Trans-Canada Highway. The highway traverses the mainland to Horseshoe Bay in West Vancouver and resumes at the Departure Bay Ferry Terminal (Nanaimo). It then proceeds south along the island's eastern shore to Victoria. Hwy. 17, the other major artery into the city, connects Victoria with the ferry terminals at Swartz Bay and Sidney on the Saanich Peninsula. Several ferry systems connect Vancouver Island and Victoria with mainland Canada and the United States. The most direct route is the Tsawwassen-Swartz Bay automobile/passenger ferry service used by the intercity buses between Vancouver and Victoria; each one-way trip takes about 1 hour, 35 minutes. BC Ferries also connects Nanaimo, 111 kilometres (69 mi.) north of Victoria, to Horseshoe Bay in West Vancouver, and departs from the north end of the island at Port Hardy to travel through the Inside Passage to Prince Rupert, where they connect with the Alaska State Ferry system. Contact British Columbia Ferries for more information; phone (250) 386-3431 outside Canada and the U.S. or (888) 223-3779 within Canada and the U.S.
Ferries linking the southern end of the island and Victoria with the United States include Black Ball Transport Inc., (250) 386-2202 or (888) 993-3779, from Port Angeles, Wash., or (800) 265-6475 for the Victoria terminal; and Washington State Ferries, (206) 464-6400 or (888) 808-7977, from Anacortes, Wash., to Sidney. Reservations are available for the Anacortes, Wash., to Sidney route; phone 1 day in advance to determine estimated waiting time. For a 2.75-hour trip to Seattle, take the Victoria Clipper , a high-speed passenger ferry; phone (250) 382-8100 for the Victoria terminal, (206) 448-5000 for the Seattle terminal, or (800) 888-2535. Most traffic activity is on Wharf, Government and Belleville streets, which embrace the Inner Harbour. Ferries arrive from both Port Angeles and Seattle, Wash. all year. The main east-west streets are Yates, Fort and Johnson. Pandora Avenue, renamed Oak Bay Avenue in midtown, crosses the city from the Inner Harbour to Oak Bay. Major north-south thoroughfares are Blanshard Street (Hwy. 17) and Douglas Street (Hwy. 1), which begins at Victoria's southern coast along the Juan de Fuca Strait. Dallas Road borders the shore and continues as Beach Drive along Victoria's eastern coast. Many Victoria streets are one-way. On-street parking is controlled by meters and posted restrictions Mon.-Sat. 9-6; rates range from $1.50 to $3 per hour (free from 6-9 p.m. and on Sundays and holidays). Vehicles parked on specially posted blocks are subject to towing during rush hours. Downtown off-street parking is available in five city parkades, three surface parking lots and shopping center lots. Rates for city-run parking are $2-$3 per hour, charged in 15-minute increments, or $16 per day ($17.50 at Bastion Square Parkade). At city parkades, the first hour is free; parking also is free Mon.-Sat. from 6 p.m.-8 a.m. and on Sundays and holidays. During free parking periods, drivers need their entry ticket to exit the parking facility. British Columbia has a 5 percent goods and services tax (GST) and a 7 percent provincial sales tax (PST). Hotel accommodations are subject to an additional 3.5 percent and alcohol to an additional 3 percent. Restaurants and admission fees are exempt from the 7 percent PST. Car rental sales tax is $1.50 per day. Royal Jubilee Hospital, (250) 370-8000; Victoria General Hospital, (250) 727-4212. Victoria International Airport (YYJ) is 22 kilometres (12 mi.) north on Hwy. 17 (Patricia Bay Highway). Air Canada flies to Victoria from Calgary, Seattle, Toronto and Vancouver. WestJet and Pacific Coastal Airlines offer domestic flights. Delta and Horizon Air/Alaska Airlines provide international flights from Seattle and San Francisco. Check with your local AAA office for cheap airline flights and vacation packages. YYJ Airport Shuttle runs between the airport and downtown hotels; phone (778) 351-4995 or (855) 351-4995. One-way, pre-booked tickets are $22; $13.50 (ages 4-17) plus a $1 fuel surcharge. Hertz, 1640 Electra Blvd., Sidney, phone (250) 657-0380; and 548 David St., Victoria, phone (250) 952-3765, offers discounts to AAA members. Contact your AAA travel advisor for help with adding a rental car to travel packages. The BC Ferries Connector, 721 Douglas St., provides daily bus service between Vancouver and Victoria via ferry. The vessels transport personal vehicles; reservations are required. Phone (778) 265-9474. Taxis charge $3.30 minimum plus $1.93 per kilometre (.6 mi.). Companies include Blue Bird Cabs, (250) 382-2222; Yellow Cab of Victoria, (250) 381-2222; and Victoria Taxi, (250) 383-7111. BC Transit buses serve Greater Victoria's downtown area 6:30 a.m.-midnight. Fare $2.50 (single boarding); $5 (day pass); free (ages 0-5). Buses run frequently between downtown and the ferry terminal. For route information, phone (250) 382-6161. Several ferry systems make connections with mainland Canada and the U.S.
Butchart Gardens (800 Benvenuto Ave., Brentwood Bay) attracts nature lovers from around the world. Thousands of bulbs and flowering trees offer a colorful show from late March to mid-June—but October and November, when the Japanese Garden takes center stage, match spring's glory with a stunning parade of reds, russets and golds. Do you know the difference between a head of state and a head of government in Canada? Learn the inner workings of the parliamentary process—and see stunning Renaissance and Romanesque architecture—on a free guided tour of the Legislative Assembly of British Columbia (501 Belleville St.). When the Legislative Assembly is in session, visitors can observe debates and proceedings from a gallery overlooking the Legislative Chamber. Victoria's Chinatown isn't as large as Vancouver's, but it is no less authentic, founded by Chinese immigrants in 1858. Wander up and down Fisgard Street, where wall murals depict turn-of-the-20th century Chinese families and the former opium dens, gambling houses and brothels that are now restaurants and businesses. Hunt for souvenirs in the shops along Fan Tan Alley, reputedly Canada's narrowest street. Miniature World (649 Humboldt St.) isn't always what you might think—two dollhouses furnished in exquisite detail, as well as a model of the Great Canadian Railway, are among the largest of their kind in the world. But there's also a miniscule, operational sawmill, a tiny circus and scaled-down European castles. What makes this themed fantasyland particularly enthralling—and one of the top things to do for kids—is that it's hands-on; push a button and something, somewhere, will start moving. Minutes away from the Inner Harbour, Government Street is packed with stores and art galleries. Do some shopping before settling into a booth at Bard and Banker, a cozy pub housed in an old bank building where you can try beer-battered fish and chips. Those who don't feel like walking can ride in style on a horse-drawn carriage tour. Victoria Carriage Tours (Belleville and Menzies sts.) offers a 30-minute narrated tour along the Inner Harbour that includes a peek at the architecturally grand homes in the historic James Bay neighborhood. Craigdarroch Castle (1050 Joan Crescent), the home of 19th-century coal mining magnate Robert Dunsmuir, is a must-see. The interior of this massive estate, capped with a distinctive red slate roof, is a feast of oak paneling, stained glass and period room furnishings. A pleasant retreat just minutes from downtown, beautifully landscaped Beacon Hill Park (Douglas St. and Dallas Rd.) is named for a pair of masts placed atop a hill that acted as navigational aids for mariners approaching the Inner Harbour. Quiet and tree shaded, it's a stroller's delight right down to the freely roaming peacocks. From Kwakwaka'wakw ceremonial masks to Northern sea lions, The Royal BC Museum (675 Belleville St.) explores every facet of British Columbia's natural and human history. Just how vast is this province? The Big Map, an animated audiovisual experience, provides a dramatic answer. Ride the Victoria Harbour Ferry water taxi to Fisherman's Wharf (1 Dallas Rd.) to see fishing boats, colorful floating houses and a few resident seals. A handful of food kiosks serve up fish 'n' chips, tacos, sushi and ice cream you can enjoy on the docks. The Swiftsure International Yacht Race (Clover Point Park off Dallas Rd.) has been a springtime tradition for more than 80 years. Thousands of people gather along the Dallas Road waterfront to watch fleets of boats navigate the tricky waters of the Strait of Juan de Fuca. The competition is known for exciting starts and nail-biting finishes and is one of the top things to do in Victoria in spring. A kid-friendly (and free) alternative to Butchart Gardens, Beacon Hill Park (Douglas St. and Dallas Rd.) draws crowds for its waterfront views, winding paths and roaming peacocks. At Beacon Hill Children’s Farm, kids will get a kick out of the “Running of the Goats,” a stampede that occurs twice daily (at 10:10 a.m. and 4:10 p.m.) when the goats run between the barn and the petting zoo. You can touch, hold and observe all sorts of creepy crawlies at Victoria Bug Zoo (631 Courtney St.), a miniature indoor zoo near the Inner Harbour. Tour guides introduce visitors to glow-in-the-dark scorpions, giant walking sticks, fuzzy tarantulas and other tropical insects and arachnids from around the world. What to do in Victoria on a rainy day? One of the best things to do with kids is Victoria Butterfly Gardens (1461 Benvenuto Ave. in Brentwood Bay). The indoor attraction is home to thousands of free-flying butterflies—including 70 exotic species—and educational displays about the butterfly life cycle. You’ll also find parrots, flamingos, poison dart frogs, koi fish and other colorful creatures throughout the tropical gardens. Miniature World (649 Humboldt St.) delights pint-size visitors with more than 80 detailed miniature dioramas depicting the streets of London, fairytale castles, railroads, a frontier settlement and the Swiss Family Robinson treehouse, just to name a few. Kids can push buttons and watch as parts of each display come to life with lights, sound and animation. The Royal BC Museum (675 Belleville St.) receives rave reviews even from those who might not consider themselves a fan of museums. Top teen-approved highlights include a full-scale model of a woolly mammoth, a collection of massive First Nations totem carvings and a re-creation of Victoria street scenes from the 1900s. Hear about the things that go bump in the night during Ghostly Walks for Halloween (560 Johnson St.), a series of special walking tours that take place mid-October through October 31. Talented storytellers combine history and theater to recount the murders, ghosts and spooky happenings around Victoria, often called one of the most haunted cities in the Pacific Northwest. Pedestrian-friendly Government Street offers a multitude of gift stores, clothing boutiques and souvenir shops all housed in Victorian-era buildings. If the shopping bags start to weigh you down, take a break for coffee, fancy tea or a sweet treat at one of the many cafés along the main thoroughfare. Hop aboard a water taxi with Victoria Harbour Ferry for a sightseeing tour at an affordable price. Knowledgeable skippers narrate the trip around the harbor, and if you disembark at Fisherman’s Wharf you’ll find some of the city’s best options for fish and chips and ice cream cones. Water taxis depart from various locations around the city; the main dock is across from The Fairmont Empress at 721 Government St.
Family fun is just about guaranteed on a local whale-watching tour, where you might spot orcas, humpbacks, porpoises and sea lions from a covered yacht or high-speed, open-air boat. 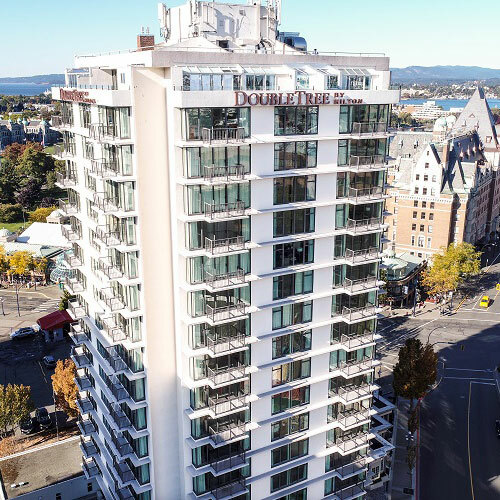 Numerous tour companies operate out of Victoria’s Inner Harbour, including Prince of Whales Whale Watching (812 Wharf St.) and SpringTide Whale Watching (1119 Wharf St.). Finding places to eat with kids can be daunting, but cozy burger joint The Pink Bicycle (1008 Blanshard St.) is a good option. In addition to the mouthwatering gourmet burgers, you’ll want to sample the mac ‘n’ cheese sticks and poutine made with rosemary gravy and locally sourced cheese curds. Young readers can hunt for a new favorite book at Munro’s Books (1108 Government St.). The beloved independent bookstore is a treat for the mind as well as the eyes— a soaring, coffered ceiling, colorful tapestries and well-stocked shelves create a cozy environment perfect for book lovers. Head straight to the back of the store for the Children’s Books section. Lined with shops carrying English tweeds and fine china, Government Street maintains Victoria's heritage as a trading post of the British Empire and offers many fun places to go. Such shops as Old Morris Tobacconist, phone (250) 382-4811 or (888) 845-6111, have distinguished Government Street since the 19th century. Established in 1833, Rogers' Chocolates is a Victoria institution that counts British royalty in its clientele and is a popular destination for chocolate-lovers. The Rogers' factory, behind the store at 913 Government St., still produces its renowned bittersweet chocolate according to a guarded recipe; phone (250) 384-7021 or (800) 663-2220. Shoppers determined to bring home something other than a few extra pounds might want to explore the craft and specialty shops in the renovated squares and malls off Government Street. More than 35 quaint stores and local restaurants in revitalized old buildings highlight Market Square, bounded by Johnson, Pandora and Store streets; phone (250) 386-2441. Trounce Alley, in the downtown core, is a hideaway of eclectic shops and a few places to eat. Shops of mid-19th-century architecture display modern items in Bastion Square, once a hangout for prospectors and drifters. An attractive shopping arcade is in Centennial Square off Douglas Street. Nootka Court between Courtney and Humboldt streets contains small arts and crafts shops. Those looking for vacation souvenirs in Victoria will find unique items like handwoven woolens from Ireland and England, hand-knit Cowichan sweaters, Inuit jade sculpture and Northwest First Nations masks and prints. The Hudson's Bay department store in The Bay Centre on Douglas Street, sells authentic Cowichan sweaters. 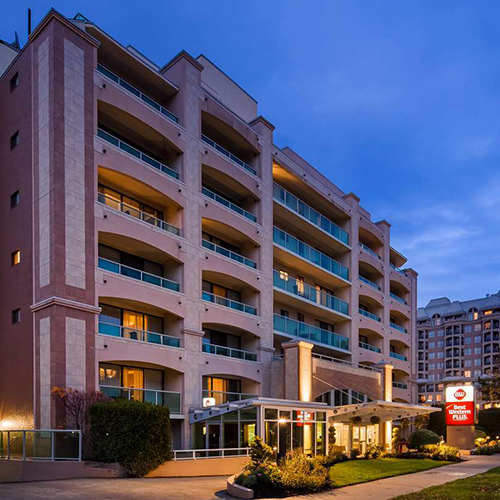 Also in Victoria are Hillside Shopping Centre, 1644 Hillside Ave.; and Mayfair Shopping Centre, 3147 Douglas St. In keeping with its Victorian image, Victoria has more than 50 antiques shops. Many are found along Government and Fort streets and Oak Bay Avenue and are worth a trip. Downtown Victoria offers plenty of things to do after dark, whether you’re in the mood for live music at a cozy pub, craft cocktails at a hidden gem, a horse-drawn carriage ride around the Inner Harbour or an ice cream cone with a generous side of people watching. Most nightlife options are within a 10-minute walk of Government Street, the main thoroughfare in downtown Victoria, so you should have no trouble getting around and making a night of it. A bonus: Downtown parking is free after 6 p.m.
Two of the best pubs in Victoria, B.C., are located just a block from each other on Government Street. Housed in an 1885 bank building, the Bard & Banker (1022 Government St.) is a local favorite for upscale pub grub (breakfast, lunch and dinner), daily happy hour specials and friendly service. Families are welcomed until 9 p.m., and live music is offered seven nights a week with no cover charge (except St. Patrick’s Day and New Year’s Eve). Another historic bank building houses the Irish Times Pub (1200 Government St.), a sister establishment to Bard & Banker. Beer and whiskey flights pair well with Irish comfort food and nightly live music. On Friday and Saturday afternoons you’ll hear traditional Celtic tunes. You’re sure to find a craft beer you like at The Churchill (1140 Government St.), where 50 taps showcase brews from British Columbia and beyond. Handcrafted cocktails and hearty pub fare (try the poutine!) round out the menu. If you’re looking for an off-the-beaten-path bar in Victoria, seek out Little Jumbo (506 Fort St.) for a drink or two. The intimate venue serves up B.C. wines as well as a rotating menu of specialty cocktails made with exotic ingredients. Little Jumbo opens nightly at 5 p.m.
CANOE Brewpub (450 Swift St.) is the place to go for craft beer and a stunning view. A large outdoor patio overlooking a private marina on Victoria’s Inner Harbour draws a crowd at sunset. Sit inside to see their brewing equipment and the beautifully restored interior, complete with crystal chandeliers and soaring timber ceilings. A small indoor stage is the site of live music Thursday through Sunday. Best Hotel Bars in Victoria, B.C. No visit to Victoria is complete without a stroll through The Fairmont Empress, the ivy-covered hotel that has been a landmark on Victoria’s harbor since 1908. Dress to impress for drinks at Q Bar (located inside the hotel’s restaurant, Q at the Empress ). It’s a good place for signature cocktails, local beers, a fancy dessert and nightly live entertainment. A few other hotel bars in the city of Victoria are worth a stop. Clive’s Classic Lounge (in the Chateau Victoria Hotel and Suites at 740 Burdett Ave.) has an extensive whiskey menu as well as handcrafted cocktails and tropical tiki drinks. Veneto Kitchen and Bar (in the Hotel Rialto at 1450 Douglas St.) earns rave reviews for its skilled bartending staff and personalized service. Swans Hotel and Brewpub (506 Pandora Ave.) is another local hangout where you’ll find house-made beers, daily happy hours and a live music scene. Nightlife in Victoria, B.C., doesn’t have to revolve around bars and lounges; there are plenty of family-friendly ways to experience the sights and sounds of the city after dark. Take a stroll along the stone walls of the Inner Harbour to see boats bobbing in the marina and the lights of the Legislative Assembly of British Columbia reflected on the water. If your feet are tired after a long day, opt to see the lights from a horse-drawn carriage ride with Victoria Carriage Tours . Private, narrated tours will take you around downtown until 10 p.m. on most summer nights. And if a decadent, Instagram-worthy dessert sounds right up your alley, don’t miss a stop at Chocolats Favoris on Government Street. The Quebec-based chocolatier specializes in soft-serve ice cream dipped in any of 12 flavors of real chocolate. The shop stays open year-round until 8 or 9 p.m. Whether you're in Victoria on vacation or just looking for cultural things to do this weekend, you'll find plenty of options and fun places to go around the city. McPherson Playhouse in Centennial Square is the center of Vancouver Island's regional and professional theater. The restored 1914 theater regularly presents noontime concerts and musical comedy productions in the evening; phone (250) 386-6121 or (888) 717-6121. The Pacific Opera Victoria, (250) 385-0222, performs at the Royal Theatre. The Royal Theatre on Broughton Street is also the home of the Victoria Symphony Orchestra, (250) 385-6515, which offers a pop and masterworks series September through May. The Victoria Conservatory of Music sometimes offers performances; phone (250) 386-5311. Contemporary plays, with an emphasis on Canadian works, are staged at the Belfry, (250) 385-6815, 1291 Gladstone Ave., while shows at the Royal Theatre, (250) 386-6121 or (888) 717-6121, 805 Broughton, range from touring musicians to classical concerts and ballet. The University Centre Farquhar Auditorium, 3800 Finnerty Rd., presents comedy, dance and other cultural events; phone (250) 721-8480. Butchart Gardens offers concerts and musical stage shows during the summer that are among the fun things to do with friends. Kaleidoscope Theatre, an open-air theater at the Inner Harbour, also offers summer productions. Top-name entertainers, rock groups and other performers draw large audiences to Save-on-Foods Memorial Centre, 1925 Blanshard St.; phone (250) 220-2600. A carillon at the parliament buildings, Government and Belleville sts., can be heard daily on the hour. The Royal BC Museum's IMAX Victoria Theatre offers big-screen films complementing the museum's natural and human history themes; phone (250) 356-7226 or (888) 447-7977. Check with your local AAA travel agency for information about vacation packages and other things to do in Victoria that are geared toward the performing arts. Victoria still embraces the English spirit, as evidenced by such popular games as lawn bowling and cricket, both played at various venues throughout the city, including Beacon Hill Park. Any belief, however, that Victoria's sports are too serious is dispelled quickly by a box lacrosse game. This offspring of the First Nations game of baggataway is a rough-and-tumble version of field lacrosse confined to a smaller, enclosed area. Canada's Parliament designated lacrosse, or boxla, as it also is called, the national sport in 1867 (hockey became the official national winter sport in 1994). Lacrosse is played from April to August at various venues, including The Q Centre, 1767 Old Island Hwy. All-star wrestling and ice hockey, two other spectator sports that hardly could be considered sedate, also are held at the arena. Water sports have obvious appeal in this island city. The wide variety of game fish around southern Vancouver Island includes rockfish, lingcod, sole and flounder; fishing licenses are required. If you're visiting Victoria on vacation, a 1-day or 8-day angling license is available. Surf fishing often yields rewarding catches of salmon and black sea bass. Clamming and oyster harvesting are popular activities on any of the Gulf Islands, which are fun places to go and accessible by ferry from Swartz Bay. Oak Bay Marina, 1327 Beach Dr., offers fishing charters at an hourly rate. Fishing equipment, a tackle shop and marine store are available; phone (250) 598-3369. Other nearby marinas include Anglers Anchorage Marina, 905 Grilse Ln. in Brentwood Bay, phone (250) 652-3531; North Saanich Marina, 1949 Marina Way in Sidney, phone (250) 656-5558; and the Westbay Marine Village, 453 Head St., phone (250) 385-1831 or (866) 937-8229. Boating is enjoyed in the Strait of Georgia and the Saanich Inlet and is a great activity for group travel. Uplands Park on Oak Bay is equipped with boat ramps. Fine beaches border Dallas Road and Beach Drive. With its scenic coastal location and balmy climate, Victoria offers excellent playing conditions for golf. On a peninsula jutting into the Juan de Fuca Strait, Victoria Golf Club, 1110 Beach Dr., is open to members of other clubs. Other golf clubs include Ardmore Golf Course (nine holes), 930 Ardmore Dr., North Saanich; Cedar Hill Golf Course (18 holes), 1400 Derby Rd., Saanich; Cordova Bay Golf Course(18 holes), 5333 Cordova Bay Rd. ; Glen Meadows Golf & Country Club (18 holes), 1050 McTavish Rd., North Saanich; Green Acres Golf Course (nine holes), 3970 Metchosin Rd. ; Henderson Park (nine holes), 2291 Cedar Hill Cross Rd. ; Mount Douglas Golf Course (nine holes), 4225 Blenkinsop Rd. ; Olympic View Golf Course (18 holes), 643 Latoria Rd. ; and Royal Oak Golf Club (nine holes), 540 Marsett Pl. Many parks are scattered throughout Victoria and its surrounding municipalities of Oak Bay, Saanich and Esquimalt and offer fun things to do this weekend. Some allow swimming, such as Elk/Beaver Lake Regional Park, Island View Beach Regional Park, Mount Work Regional Park, Thetis Lake Regional Park and Willows Park. Hiking, nature and horse trails are found at several parks. For more information contact Victoria Parks, Recreation & Culture; phone (250) 361-0600. Bamberton Provincial Park offers developed recreational facilities, including camping. Swan Lake-Christmas Hill Nature Sanctuary , 6.5 kilometres (4 mi.) north via the Patricia Bay Highway, can be explored by hiking trails and floating walkways weaving through the area. Excellent views of Victoria and the sea are at Mount Douglas, Mount Tolmie and Beacon Hill Park. Sightseers using Victoria as a base for their vacation can explore the Gulf Islands and Vancouver by ferry from Swartz Bay, north of Victoria via Hwy. 17; for schedule and toll phone BC Ferries at (250) 386-3431 or (888) 223-3779. Opportunities for whale watching are offered by several boating companies, the oldest of which is Orca Spirit, 146 Kingston St.; phone (250) 800-3747 or (877) 815-7255. A whale-watching trip is a great option for group travel and one of the fun things to do with friends in Victoria. Guided tours of the city in red double-decker buses from London enhance Victoria's British atmosphere. Many of these tour operators are found along Belleville and Menzies streets by the harbor. Gray Line, 4196 Glanford Ave., (250) 385-6553 or (855) 385-6553, conducts bus tours, including a hop-on, hop-off service; tickets can be purchased at a kiosk at 721 Government St.
Narrated horse-drawn carriage tours of the city are offered by several companies, including Tally Ho Carriage Tours , phone (250) 514-9257, and Victoria Carriage Tours , phone (250) 383-2207 or (877) 663-2207. All tours leave from the corner of Belleville and Menzies streets. The Visitor Centre has information about things to do and such scenic routes as Marine Drive along the shoreline, a trip to Sooke Harbour on the west coast and the Malahat Drive, which runs along the east coast and reaches an elevation of 381 metres (1,250 ft.). The trip to Butchart Gardens is one of the most popular drives, following Hwy. 17 and Hwy. 17A through the rural communities and pastoral valleys of the Saanich Peninsula. Victoria is the perfect size for visitors keen on walking. A favorite thoroughfare of strollers and shoppers is Government Street, graced by banners and five-globe Victorian lampposts supporting baskets of geraniums and petunias. Stop in at the Visitor Centre for details and destination information, or contact your local AAA travel agency for help with vacation packages and travel tips. AAA editors suggest these activities for a great short vacation experience. Visit several gardens that serve as reminders of the city's British heritage (we'll get to the horse-drawn carriages and tearooms later in the day). Head to the Oak Bay neighborhood to Abkhazi Garden (1964 Fairfield Rd.). Though petite in size, the garden is resplendent in its beauty. Set on a rocky slope, the dramatic landscape is planted in rhododendrons, Japanese maples, azaleas, evergreens and alpine plants. Nearby is Government House and Gardens (1401 Rockland Ave.), home to the province's lieutenant governor. The formal gardens include spaces devoted to heather, iris and roses and plantings typical of an English country garden. A turreted, 39-room, four-story estate is next on your list. Craigdarroch Castle (1050 Joan Crescent) was built in the 1880s by a Scottish immigrant from a coal mining family who became one of the richest men in British Columbia. The impressive staircase, oak paneling, period furnishings and stained glass reflect 19th-century elegance. By this point, you've probably worked up an appetite. Stop at Bin 4 Burger Lounge (911 Yates St.) for lipsmacking gourmet burgers made from hormone-free beef, chicken, tofu, bison, lamb, pork or Ahi tuna. Refreshing salads and lettuce wraps are tempting options. Spend the rest of the day in the lovely Inner Harbor area. Cultural and natural provincial history is the focus of The Royal BC Museum (675 Belleville St.), a treasure trove of information about the province's development. Start at the First Peoples Gallery with its ceremonial masks and a full-size chief's house. Hear what a mammoth might have sounded like as well as other sounds from the Ice Age in a gallery devoted to natural history. Step outside to Thunderbird Park (Douglas and Belleville streets) to see a collection of Northwest Coast totem poles. Practically around the corner in The Fairmont Empress (721 Government St.) hotel is Miniature World (649 Humboldt St.). Incredible attention to detail is obvious in more than 80 dioramas, all intricately created in miniature. The world of the circus is elaborately crafted in teensy elements, as are dollhouses, castles, battle scenes and a 17th-century London cityscape. 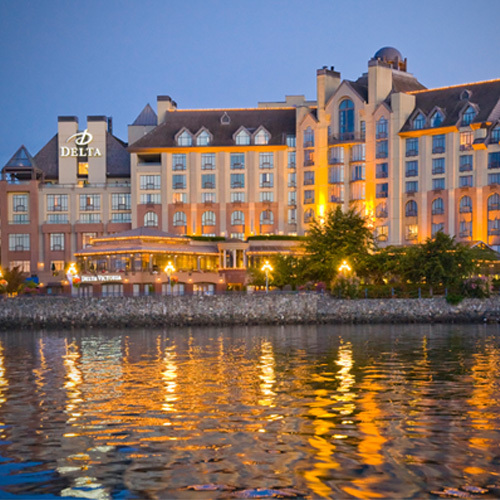 The palatial Fairmont Empress itself is worth a visit. Resembling a castle, the hotel is a Victoria landmark and known for its afternoon teas, a tradition since the hotel opened in 1908. Have a seat in the Tea Lobby and treat yourself to the English ritual (advance reservations are necessary). In addition to tea, sandwiches and pastries (think mango and curried chicken sandwiches and berry tarts) and raisin scones with heavy cream and strawberry preserves are served. Although worth a splurge, other options offer less expensive versions of the afternoon tea experience; try White Heather Tea Room (1885 Oak Bay Ave.). After the formal tea ceremony, a stroll and shopping on Government Street are in order. Victorian lampposts and colorful hanging baskets add to the city's charm. Browse through the 19th-century shops selling English woolens, fine china and other British imports; chocolates; Northwestern First Nations and Canadian art; clothing; and jewelry. For a very British way to begin the evening, there's a horse-drawn carriage awaiting. Head over to the corner of Belleville and Menzies streets where the carriages queue up. If enticing aromas from waterside restaurants beckon, there are many options near the harbor. Depending on your taste and pocketbook, you might want to consider Pagliacci's (1011 Broad St.) or Vista 18 (740 Burdett Ave.). After satisfying your appetite, take a romantic walk alongside the stone walls of the Inner Harbor. Enjoy the soothing breezes, the boats bobbing in the marinas and the lights illuminating the classic lines of the Legislative Assembly of British Columbia (501 Belleville St.). In addition to its many cultural and historic landmarks, this destination hosts a number of outstanding festivals, events and fun things to do that may coincide with your vacation. As a city of traditions, Victoria celebrates many events and festivals each year. The weekend following Victoria Day in May features the classic Swiftsure International Yacht Race , which has drawn an armada of more than 185 sailboats from all over the world since 1930. The Victoria Highland Games & Celtic Festival takes place in mid-May. Boating enthusiasts will enjoy the Victoria Classic Boat Festival at Inner Harbour over Labour Day weekend. There will be a steamboat cruise, rowing regatta, boat races and lots of nautical fun. Book your travel packages and vacation packages early or contact your local AAA travel agency to plan your trip. Autumn shows off its best colors along the rural Saanich Peninsula, where the Saanich Fair has been held Labour Day weekend for more than a century and is one of the many family-friendly things to do in Victoria. Fall's lower temperatures provide an energy boost for the mid-October GoodLife Fitness Victoria Marathon. During late October, however, guests can experience a chill that has nothing to do with the weather at the Ghosts Walks for Halloween guided walking tours. Wrap up an incredible holiday journey in late November with the “jolly old elf” himself at Santa's Light Parade in the streets of Victoria. See all the AAA recommended things to do and events for this destination.